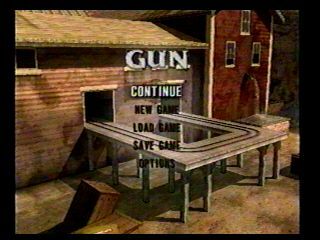 GUN was released in November 2005 for five platforms and takes place in the American old west. It is a third-person shooter where you play as Colton White, a cowboy who is trying to solve the mystery behind his father's death and what his killers were looking for. The game features horseback riding and an interesting storyline with good voice actors. Best time: 1:18:46 by Tomi 'sarou' Salo on 2008-01-01 in 37 segments. First of all, many thanks to Mike, nate and Enhasa for still keeping up this awesome site and posting all those runs. This is a little over 58 minute improvement over Mitsukai's old run. I didn't quite make the 1 hour improvement I promised when I started this but honestly at some point I didn't think I was gonna be this much faster because how the game's designed. The game has a lot of waiting, following npc's around and defence missions which have a timeframe that's very easy to match. Then again some of the following missions are very hard to optimize because you can't go too far away from the character you're following because then you'll get mission failed. This game also has a very annoying checkpoint system which almost completely makes all breaks useless because nothing is loaded unless you pass through all the checkpoints neatly placed around every corner. I managed to totally break the game if I might add, once you get to Dodge City, you can skip repairing the bridge and slide backwards inside the ground with your horse into Magruder's mine. Alas, nothing is loaded so it's no good. Then again, this checkpoint system provides many possible savewarps which I use throughout the run. There's also a little auto-aim thingie implemented, probably a leftover from the console version, which is just horrible when speedrunning. Not only the weapons are inaccurate as hell but when the crosshair starts bouncing left and right on it's own, it really helps nobody. On top of all this, the game is also very random and glitchy in a bad way. I was lucky that the game never crashed during a good attempt. Also the loading times are done behind the scenes, so sometimes when going really fast with your horse in a load infested zone, it gets really choppy and graphics start to disappear and so on. Nevertheless, the game is pretty fun when played normally, but it's a horrorfest to speedrun. Oh yeah, I almost forgot to add that the game likes to replenish your health and ammo all the time so the run may not seem very consistent. If you want to read more "indepth" comments of each segment, search the GUN improvement thread at the PC section.